The James William Carling Pavement Art Competition! 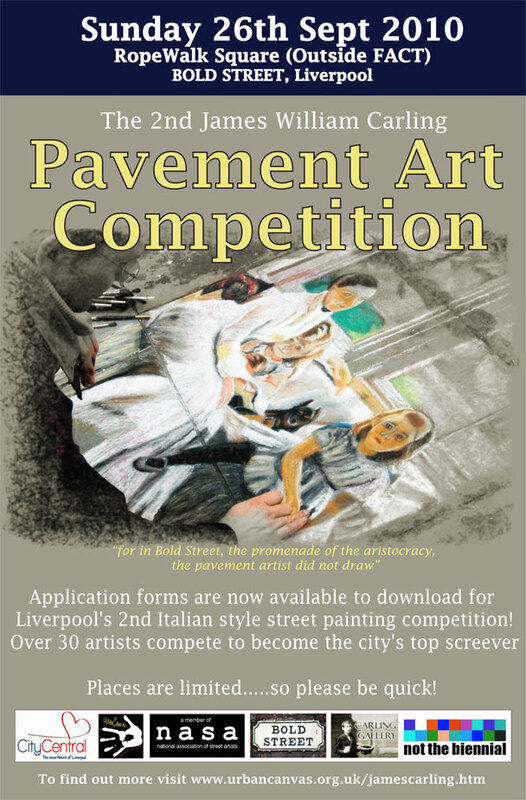 We are now accepting applications…… worldwide, the UK and Merseyside for Liverpool’s second James Carling Pavement Art Competition….Over £1000 worth of cash prizes plus runner up prizes, Four Competitions in one! Open to professional and amateur artists; with live video streaming worldwide across the internet….follow up work opportunities and high profile press coverage…..this must be one of the best street art competitions anywhere in the UK! Mike McCartney has now been confirmed as a competition Judge and his comment was….”I CAN’T WAIT”! Please feel free to pass on to anybody who may be interested…..and remember….you’ve got to be in it to win it!! 18 Aug	This entry was published on August 18, 2010 at 9:53 pm. It’s filed under arts, culture, street art and tagged 2010, art, artists, arts, battle, canvas, carling, chalk, chalking, competition, culture, event, james, liverpool, mccartney, mike, pavement, philip, public, screever, sidewalk, street, uk, urban, urbancanvas, william. Bookmark the permalink. Follow any comments here with the RSS feed for this post. Older: And God created Street Art……..